Recently, I’ve been going through David Poile’s drafts as general manager of the Nashville Predators to determine which years were successful at producing talent and which ones weren’t. So far I’ve looked at the 1998 Draft, which produced franchise icon David Legwand, and the 1999 Draft, when Poile selected Martin Erat, who was eventually traded for Filip Forsberg. In this installment, I continue moving forward to the 2000 Draft, the year the New York Islanders took Rick Dipietro first overall. In total, the draft produced a lot of impactful NHL players even if there weren’t a lot of high-end players. Seven played in at least 1,000 games, but no one reached the 500-goal or 1,000-point marks. There was, however, one future Hall of Fame goaltender selected late that I’ll get to in a bit. For Poile and the Predators, the 2000 Entry Draft was a forgettable one. Just five of the players selected reached the NHL, and only two played more than three games. So, let’s dive into each of the 12 picks Poile made. For the second straight draft, the Predators held the sixth-overall selection. This time they used it on winger Scott Hartnell from the WHL’s Prince Albert Raiders following a 27-goal, 82-point performance in 1999-00. He became an NHL regular the following season and played five more seasons with the Predators through 2006-07, accumulating 436 regular-season games and twice hit the 20-goal mark. 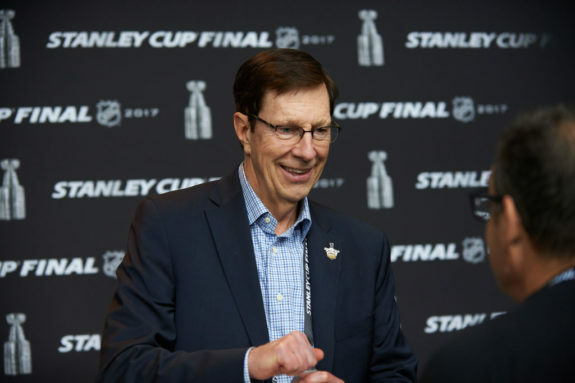 In June 2007, Poile dealt Hartnell to the Philadelphia Flyers for a 2007 first-round pick (used on Jonathan Blum), and it was there that his career took off. From 2007-08 through 2013-14, Hartnell played in 517 regular-season games as a Flyer, scored 157 goals and added 169 assists. He reached 20 goals in all but two seasons and twice scored at least 30. He was a major reason the team qualified for the postseason each year he was there, excluding the 2012-13 lockout-shortened season. He was productive in the playoffs as well, including in 2010 when he posted eight goals and 17 points as the Flyers reached the Stanley Cup Final. 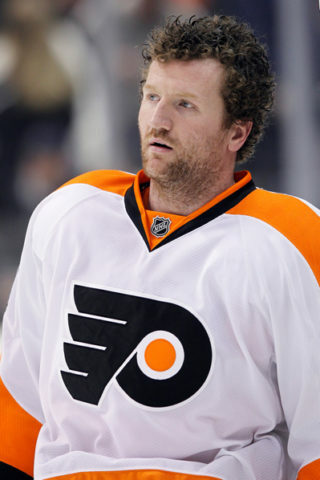 In June 2014, the Flyers traded him to the Columbus Blue Jackets. Hartnell played three seasons with them and hit the 20-goal mark in two of them before his contract was bought out during the 2017 offseason. He rejoined the Predators for the 2017-18 campaign and posted 13 goals and 24 points before retiring at season’s end. His Nashville tenure ended with 498 regular-season games played, 106 goals and 235 points. As of the 2018-19 season, he was tied for eighth all-time in franchise history in goals and second in penalty minutes with 626. In the 2000 draft class, Hartnell’s 1,249 games played were the most as of the 2018-19 season, his 327 goals were third-most and his 707 points were fourth-most. In round two, Poile went after another winger, this time Daniel Widing from Sweden’s SEL where he posted 15 goals and 27 points in 34 games with Leksands IF in 1999-00. He spent the next six seasons in Europe before leaving for North America. He appeared in three games during the 2006-07 season with the Predators’ AHL affiliate, the Milwaukee Admirals, and went pointless. He finished that season back in Sweden, and as of 2018-19 was playing in the SHL with Rögle BK. Long before he was talking about bears or how big the universe is, the then-Mighty Ducks of Anaheim drafted goaltender Ilya Bryzgalov eight spots after the Predators selected Widing. He was drafted from Russia’s Lada Togliatti and he reached the NHL in 2001-02. He became a full-time NHLer in 2005-06 and helped the Ducks win the 2007 Stanley Cup. He played 12 NHL seasons and appeared in 465 games with a 221-162-54 record, a .912 save percentage (SV%) and a 2.58 goals-against average (GAA). He retired after the 2014-15 season. With the first of two third-round picks, Poile went back to Sweden and drafted defenseman Mattias Nilsson from MODO in the SEL after he posted five goals and 10 points in 33 games his draft season. He never signed a contract with an NHL team and played his entire career in Sweden. He retired after the 2015-16 season. Missed Opportunity: Mike Rupp, F – Drafted 76th overall by the New Jersey Devils. Rupp was originally drafted ninth overall by the Islanders in 1998 but never signed and reentered the draft in 2000. The Devils drafted him and he spent two seasons in the AHL before making his NHL debut in 2002-03. He won the Stanley Cup with the Devils that season as a rookie. He went on to play a total of 610 games across 11 seasons and totaled 54 goals and 99 points. He retired after the 2013-14 season. Poile used the other third-round pick on winger Libor Pivko from HC Havirov of the Czech Republic. He had 11 goals and 22 points in 40 games his draft season. He played three more seasons in the Czech Republic before joining the Predators during the 2003-04 season. He played in 57 AHL games and one NHL game that season. He played exclusively with the Admirals the next two seasons before returning to the Czech Republic. He played in Europe, mostly in the Czech Republic, through the 2014-15 season, after which he retired. In his lone NHL game, he failed to record a point. The Kings drafted Visnovsky out of Slovakia and he was a full-time NHLer the following season. 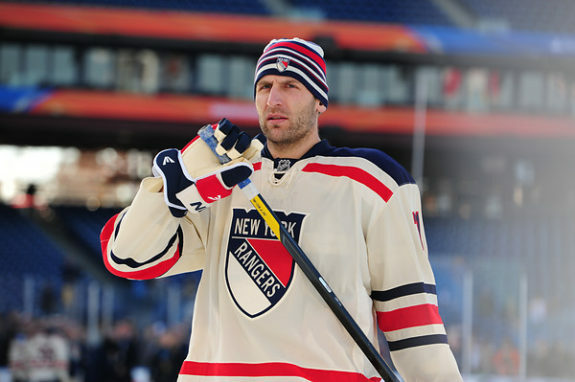 He played 14 NHL seasons and finished his career with 883 games played, 128 goals and 495 points. He was a three-time 50-point producer and one-time All-Star. After the 2014-15 season, he returned to Slovakia to play in the KHL and retired following the 2015-16 season. Poile really enjoyed fifth-round picks in 2000, using three of them. He used the first one on Matt Hendricks out of Blaine High School in Minnesota. There he posted 23 goals and 53 points in 21 games. He was committed to St. Cloud State and played four seasons with them before turning pro at the end of the 2003-04 season with the Admirals. That was his only season in the Predators system. He eventually reached the NHL with the Colorado Avalanche in 2008-09. The Predators signed him as a free agent on July 5, 2013 and he played 44 games with them during the 2013-14 season, scoring two goals and two assists. He was traded to the Edmonton Oilers in Jan. 2014 in exchange for goaltender Devan Dubnyk. As of the 2018-19 season, he has played 11 NHL seasons for six teams and has totaled 607 games, 54 goals and 116 points. The Predators drafted defenseman Mike Stuart out of Colorado College after a two-goal, seven-point season. He played two more college seasons and never signed with the Predators. 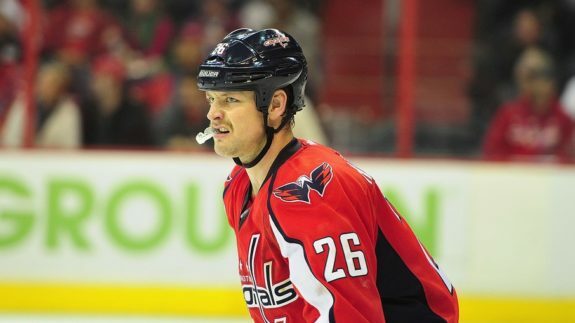 Instead, the St. Louis Blues signed him as a free agent in 2002 and he played in their system through 2006-07, when he left to play in Austria for two seasons. He split the 2009-10 season between the ECHL and Norway and retired at its conclusion. He appeared in one NHL game in his career and failed to accumulate any points. Poile drafted center Matt Koalska from the USHL’s Twin City Vulcans (now the Tri-City Storm) after he was better than a point-per-game player his draft season. He played four seasons with the University of Minnesota and the Predators never signed him. The Islanders signed him as a free agent in Aug. 2004 and he played for their AHL affiliate in 2004-05 and 2005-06. He made his NHL debut with the Islanders in 2005-06 and appeared in a total of three NHL games with no points. Islanders traded him to the Ottawa Senators in Jan. 2007 and he retired after the 2006-07 season. Five spots after the Predators drafted Koalska, the Avalanche drafted defenseman Liles from Michigan State. 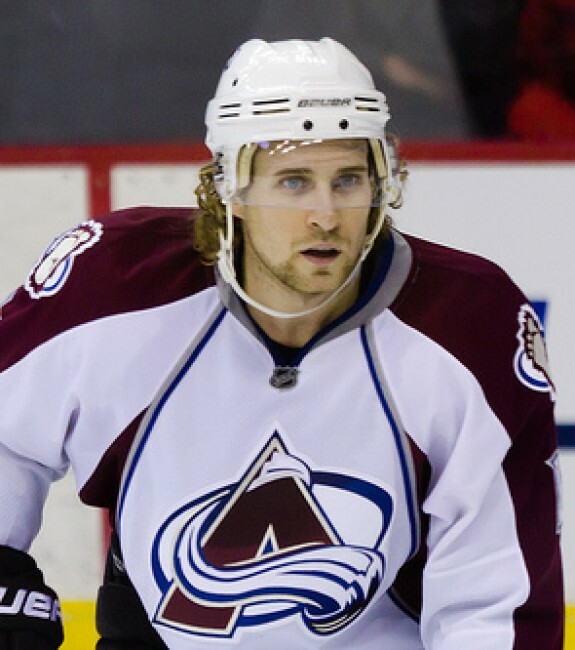 He played three more college hockey seasons before signing with the Avalanche and he made his NHL debut in 2003-04. He played six more seasons with the Avalanche and 13 total in the NHL before retiring after the 2016-17 season. He played in a 836 games and scored 87 goals and 370 points. In his first of two sixth-round picks, Poile went back to Slovakia and drafted defenseman Tomas Harant from Zilina. In his draft season, Harant posted one goal and 10 points in 31 games. He never signed with the Predators and stayed in Europe through 2005-06. In 2006-07, he signed a contract with the Devils and accumulated 54 AHL games but never reached the NHL. He returned to Europe in 2007-08 and stayed there through 2017-18 when he retired. The Devils drafted defenseman Deryk Engelland from the WHL’s Moose Jaw Warriors and it took him until the 2009-10 season to reach the NHL, doing so with the Pittsburgh Penguins. 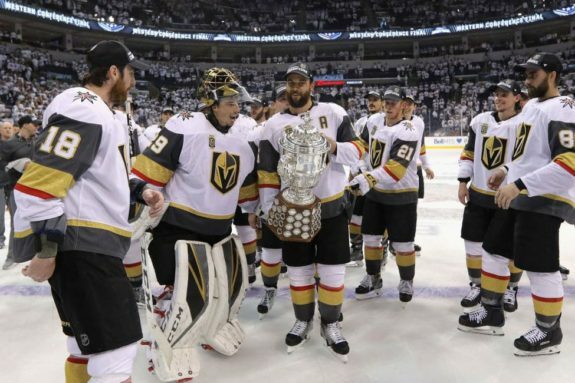 As of the 2018-19 season, he was still playing, as an alternate captain of the Vegas Golden Knights. He accumulated over 600 regular-season games and 100 points, helped the Golden Knights reach the Stanley Cup Final in their inaugural season and won the 2018 Mark Messier Leadership Award. With his second sixth-round pick, Poile drafted Czech-born winger Zbynek Irgl from Vitkovice HC of the Czech Republic after he scored seven goals and 12 points in 47 games his draft season. Irgl never made the jump to North America, instead playing in Switzerland, the KHL and the Czech league, and as of 2018-19 he was still playing in the Czech league. In the seventh round, Poile drafted Slovenian Jure Penko, the only goaltender he selected in 2000. Poile drafted Penko from the USHL’s Green Bay Gamblers after he posted a .906 SV% and a 2.81 GAA in 40 games. The Predators never signed him and he played one more season in the USHL and one in the ECHL. He spent the 2002-03 season in the Central Hockey League before heading to Europe. He played in Slovenia through 2007-08, after which he retired. If the Predators needed to select a goaltender in the seventh round of the 2000 Draft, they missed out on a great one. The Rangers drafted Lundqvist from Sweden’s SEL two picks after the Predators picked Penko. 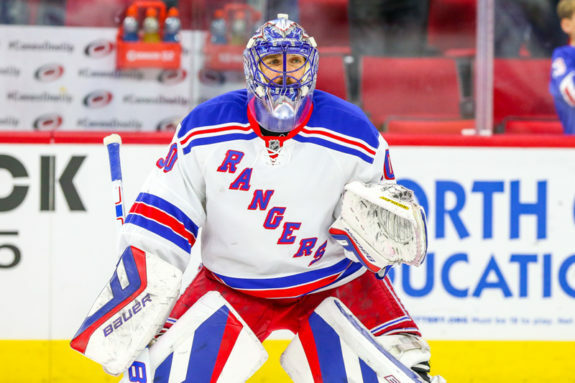 Lundqvist reached the NHL in 2005-06, and as of 2018-19 had played 14 NHL seasons, all with the Rangers. He won the 2012 Vezina Trophy and was a finalist for the trophy four more times. Although Poile wasn’t the only GM to pass on Lundqvist multiple times, missing out on a future Hall-of-Famer is a tough pill to swallow. With the Predators’ penultimate pick of the 2000 Draft, Poile selected Swedish defenseman Mats Christeen from Södertälje SK J20 of the SEL. In his draft season, he totaled two goals and 10 points in 19 games. He never left Sweden and played in the country’s various leagues, most recently for AIK of the Allsvenskan league in 2006-07. He retired at season’s end. Poile used his last pick of the 2000 Draft on another defenseman, this time Martin Höhener from EHC Kloten of Switzerland’s NLA. There, he posted four goals and six points in 44 games his draft season. Like Christeen, Höhener never left Europe and played his entire career in Switzerland. He retired after the 2012-13 season. The 2000 Draft was not a good one for Poile and the Predators. Not only did seven of the 12 picks never reach the NHL, but only Hartnell made a sizable impact for the Predators. What makes it even worse is that there were notable players selected soon after the Predators made their selection, including Bryzgalov and Lundqvist.